Alside Windows – Exceptional Products for an Elegant Exterior! Realize your vision of a beautiful and energy-efficient home exterior. 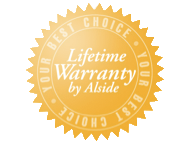 For more than 65 years, Alside has provided exceptional building products for homes and businesses throughout the country. Our commitment to innovative design, advanced technology, superior craftsmanship and outstanding customer service has defined our legacy as a true industry leader. For a variety of looks from traditional to contemporary, no matter what the application is, Alside has you covered.